So you’ve decided to host a casino themed party, whether it will be a real money casino for fundraising, or just a fun casino themed night. But now you’re stuck for casino party food ideas! 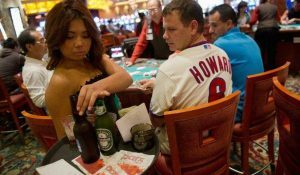 What food and drinks you serve depends greatly on what kind of ‘casino’ you want yours to be, as casino food varies greatly. You want a 007 feel? Serve up some classy canapes and cocktails. Thinking of a more Vegas feel? Perhaps a casino style buffet with shrimp cocktail, meatballs and other classic finger foods. Sticking to finger foods that aren’t too greasy is a good idea, so guests can snack and play at the same time. Maybe bring out more dishes every hour or so to keep them going! If you’re not sure what finger food to serve, we have many casino party food ideas. Shrimp cocktail is great, as are crudites and chips with dips: crab dip, spinach and artichoke dip, onion dip… there are so many that would work. Stuffed olives will up the classy feeling, as will a fruit and cheese tray, and meatballs will keep your guests satisfied. If you want a more classy European casino feeling, go for sophisticated canapes like prosciutto wrapped asparagus or melon, bacon wrapped dates, mini frittatas, toast and pate. If you want to go all out on your casino themed food, why not serve all red, white and black foods? Black olive, tomato and feta tarts, red velvet cake, strawberries dipped in white and dark chocolate, ans cream cheese with red pepper strips, are all great casino party food ideas. We hope your head is already full of casino party food ideas, but for a little extra, here are some simple casino recipes to try. If you’re going the classy canape route, blinis with a dollop of crème fraiche, some caviar and a sprinkle of chives or dill will never go wrong. If you use black and red caviar, that plus the white of the crème fraiche gives you themed colours! Skewers with baby tomatoes, mozarella and basil are also great. Another fun idea is to make dice jello shots – and they’re super easy! Just make red jello, slice it up into squares and add dots of white frosting for the dice numbers. We don’t have space for more herre, but you will find more detailed casino recipes online. If it’s in your budget, it’s a great idea to hire a bartender to mix those classic casino cocktails for your guests. You could even have themed cocktails such as the ‘Face Card’ (Malibu and pineapple juice) or the ‘High Roller’ (whipped vodka and cranberry juice). Otherwise, learning to make even just a martini yourself will go down a treat. You could also set up a do-it-yourself bar with various spirits, mixers and garnishes and some casino recipes for drinks up on the wall!. If you don’t want to go down the cocktail route, champagne, beer and punch (red of course!) also work well. And don’t forget to have lots of water available! There is so much else we could put in this article, but you’ll have to find that for yourself! The best idea is to decide on what kind of casino party you want, and then go with food that matches that. 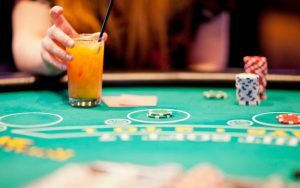 We hope these casino party food ideas have set your brain in motion, and that you’re starting to get excited for your casino party! This is a time to let your creativity shine.